The basic craft supplies are always available for the children to use independently throughout the day – pencils, crayons, chalk, scissors, glue, tape, rulers, magazines and various types of paper. The children’s choice of paper is something that I find interesting. The current school-age children go through vast amounts of plain white paper, cutting pieces and gluing/taping them together to create books, masks etc. They seem to have no interest in the coloured paper or adding colour to their projects – unless there is paint. The school-age children I had here for the summer preferred to use the lined paper. They created impressive stories and art work filling every space on one paper before selecting another piece of lined paper. They never chose plain white paper or coloured paper. For the preschoolers paper choice is a major decision often taking more time than anything that they add to the paper. Coloured paper has been their favourite ever since I showed them that the white pencils/crayons were not ‘broken’, but you could only see them on darker paper. 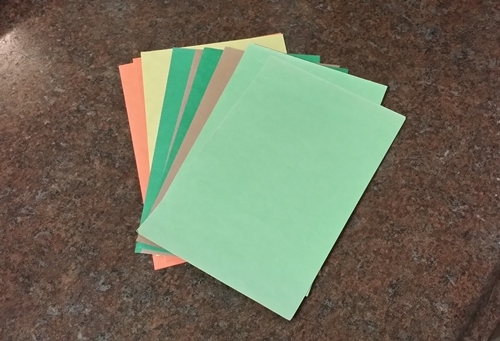 If several of the preschoolers are at the table at the same time the paper choice process takes even longer since they often rethink their colour choice if the others pick a different colour. Every time I restock the coloured paper the selection process is the same. Pink paper is always the first choice and when all the pink paper is gone they will choose purple. After that the decisions get more difficult – light blue, dark blue, red or black get used up next but they definitely are not the preferred colour choices. In fact, after the pink and purple are gone they often choose plain white or lined paper over the other coloured paper. Yes, they are. Throughout all our activities we often discuss favourite colours as well as other likes & dislikes but until she mentioned it I had never even noticed that the ‘leftover’ paper pile contained all my favourite colours. Awww, all this time have they been leaving those papers for me? I always thought they picked pink and purple first because they liked those colours best but now I’m wondering if they chose them because they know I don’t like pink and purple. What you do is beautiful. I couldn’t be happier with where my boy is.